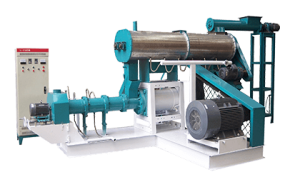 Fish feed dryer is usually used in combination with fish feed cooler in the fish feed pellet line. 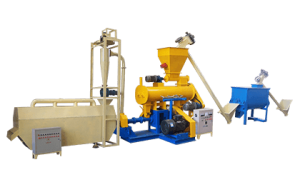 Fish feed pellets are transported from fish feed extruder to the pellet dryer machine, then being conveyed on the mesh belt which is made of stainless steel. Speaking of the mesh belt, it is with multi-layer structure and movable, which makes our dryer fast-drying & high-efficiency, so the dryer machine is also called Mesh-belt Type Fish Feed Dryer. This pellet dryer machine is widely applied in chemical, food, medicine, building materials, electronics and other industries, specially applicable to dry granular materials and pellets. There is circulating fan, heating device, fresh-air-suction-system and exhaust-exiting system. 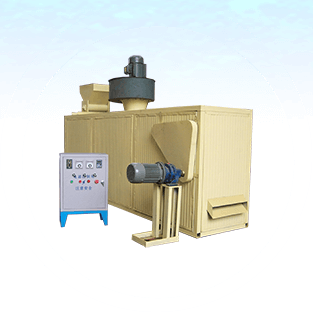 Operator can take independent operational parameter control of temperature, humidity and exhaust gas re-circulation rate, which ensures the reliability of the fish feed pellet dryer, and the optimization of the operating conditions. Mesh-belt Type Fish Feed Dryer has good security and operation flexibility. The drying process is carried out in a fully-sealed box, effectively avoiding dust leakage. Damp materials are evenly spread on the mesh belt which is driven to move by transmission device in the dryer machine. From bottom to top, hot air flow through the mesh belt and fish feed pellets on it. In the drying process, heat exchange is sufficient & uniform, drying efficiency being extremely high. 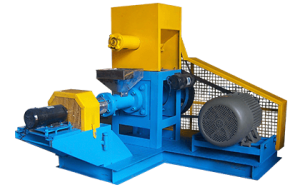 The machine head is composed of two driven rollers, tightener, feed inlet and outlet. Passive bearing bears the tension and determines the tightness of the mesh belt, so bearings at both ends of the passive rollers should be regularly lubricated with high temperature (above 200℃) lubricating grease, to ensure the normal operation of the dryer. Tightener is to adjust the mesh belt tightness. The first installation, mesh belt should be tightened, and after heating up, tightening again (because of the thermal expansion). This stage is the actual working area of material drying, blast pipe and discharge pipe being installed on the top. Hot air flows into the underpart of the inner chamber from both sides, then extracted out by wind turbine from the middle. There are control valves being installed on the air inlet and outlet to adjust air velocity. The transmission part is installed in the end of the fish feed pellet dryer. The tightness of the transmission chain can be adjusted by adjusting the position of the gear reducer. Transmitting gear on the other side of the gear reducer will also inject lubricating oil to extend its service life. Can the feed dryer be used in drying fish?